Thunderbolt was once limited to just a handful of device manufacturers, but in 2018, that number has grown a bit. AppleInsider talks about Nekteck's Thunderbolt 3 SSD after using it daily for about six months now. Nearly everything on Apple's currently shipping Mac line has a Thunderbolt 3 port. While these ports can be used for USB 3.1 type C drives, if you've got the opportunity to attach faster storage, it can be worth it. Before we delve too deeply into the performance, the Nekteck 480GB Thunderbolt 3 SSD that we're testing is a 480GB model, with a permanently attached Thunderbolt 3 cord that retails for $299. On the product page for the drive, manufacturer Nekteck claims that it provides up to 2300 megabytes per second read speed, and 1400 megabytes per second write speed. More on that in a bit, though. The enclosure is designed to prevent casual removal of the media. To Disk Utility, it identifies as PCI-E storage. Nekteck is properly identified as the vendor in the macOS System Report. And, we're going to say this straight away. We're not big fans of the permanently attached cable. While we're sure Nekteck customer support will deal with this in the case of breakage after a conversation we had with them asking about it, a socketed Thunderbolt 3 connection makes more sense to us from a user perspective. For the most part, Nekteck's advertised specs are in the ballpark. We were routinely seeing 2250 MB/sec reads, and 1171 MB/sec writes with timed data transfers, as well as the Blackmagic Disk Speed Test. This is refreshing in a drive industry that routinely far over-promises, and under-delivers. In an artificially long test utilizing nearly the entire capacity of the drive, heat was a small issue. In an office at 20C, writing 100GB chunks of data for about an hour continuously saw the write speeds drop to 800MB/sec, with read speeds slightly falling to 2100 MB/sec. These aren't deal-breakers, though, and still more than enough to use the drive for ProRes 422, or 10-bit video workflows. Under normal use patterns, the enclosure never gets more than slightly warm to the touch -- but it will get hot if you hammer on it for a long period of time. A non-contact infrared thermometer reported temperatures at the enclosure's surface of 28C after 15 minutes of constant writing and reading, with it hitting 36C after two hours. This is in comparison to the 39C that the upper row of keys in an i9 MacBook Pro can hit under load. 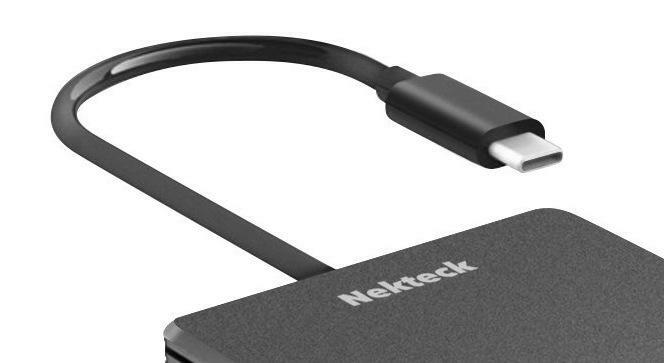 Nekteck has been in business since 2014, and is more known for mobile accessories than Thunderbolt 3 drives. The company has just a handful of Thunderbolt 3 products, including a dock, a dual-display adapter, a few cables of assorted lengths, and this drive. We had already purchased a few USB 3.1 type C drive enclosures from them for personal use before we saw the drive, so when the opportunity presented itself to review the SSD, we decided to take the chance. We're glad we did. But, as with most high-speed Thunderbolt 3 drives, the cost per GB isn't low. Over the holiday weekend we saw the first sub-$100 SATA 3 1TB SSD with other models routinely at the $150 pricepoint -- this clearly out-performs that, but ignoring speed and minus "doorbuster" sales, the former at $0.15 per GB plus whatever the enclosure costs much less per GB than the $0.62 per GB that the Nekteck unit delivers. How much the extra speed is worth is an exercise that the reader has already performed once, when deciding whether or not to buy flash storage from Apple at about a $1 premium per GB above the 128GB that's already included. That said, that Mac mini for $799 with no storage upgrade beyond the 128GB, plus the $299 for the Nekteck drive gives you 608GB of total storage, for $100 less in total. Also, getting the drive to work on an older Thunderbolt machine is an extra expense. Apple's adapter is a bi-directional Thunderbolt 3 male to Thunderbolt 2 female one, so to get this to connect, you'd have to use a Thunderbolt 3 dock, adapted down to Thunderbolt 2, with the Nekteck drive connected downstream of the dock. If this is your workflow, consider just getting a USB 3.0 type A enclosure for a SATA 3 SSD and sacrifice speed for universal compatibility and a cheaper drive. If you're looking for solidly performing and fast external storage specifically for newer gear for not too much money, AppleInsider recommends the Nekteck Thunderbolt 3 480GB drive and gives it a 4 out of 5 with the only real ding being the permanent, and short, cable. While wear and tear on a carried around Nekteck would be a worry, would not a detachable cable cost more to buy? It might be a reasonable trade off for price if this was to permanently hang off the back of a Mac mini. It's a tradeoff, of course, as are many things. I think I'd take that tradeoff, though, personally. As far as hanging off a mini goes, it shouldn't take that much abuse in that role. Mike, how would you compare this product to the 500 GB OWC Envoy Pro? (also TB3, slightly slower speed but 3 year warranty vs. 1 year; both permanently attached cables) The speed difference doesn't bother me. I won't be doing heavy video editing. I prioritize reliability, especially related to heat buildup. I guess I'm not clear what the question is. It is a Thunderbolt 3 drive. There's only one end it could possibly be. I'll take it under advisement, though. I suspect the thermal characteristics are about the same, but less than 40C steady state is no real danger to flash cells or the electronics contained within. I'll find out. That three year warranty is nice, though. No question. Just a request to show the complete product. Perhaps they wanted to prevent complaints from users who mistakenly try to use a USB 3.1 cable rather than a Thunderbolt cable. That would be a problem, right? This is the kind of product I'd buy for the office, but the permanently attached cable rules it out for me. If the cable gets damaged I need to be able to swap in a new one right f'ing now so I can get to my data, not send the whole thing back for repair — that's a joke. The enclosure seems kind of big, too, as if it houses a regular 2.5" notebook drive. A compact enclosure with M2 card would be better. And for $299 I want to see more attention paid to cooling. All in all this is about a 2/5 score IMO. But the real problem with TB3 drives in general is of course the USB3 competition. While TB3 is a bunch faster, for ordinary uses USB3 is plenty fast enough at a much lower price point. It would be nice to see more 35+ people. That's a very good point, I hadn't thought of that. Why are enclosures so expensive? The chipsets and cables only cost a few dollars more than USB-C.
Might be economies of scale. USB enclosures likely outsell Thunderbolt twenty to one or more, allowing the manufacturer to spread out the cost of design and tooling over a greater quantity and reducing the amount each individual sale has to contribute to cost recovery. Or maybe they just use the perception of Thunderbolt being a "premium" interface as an opportunity to increase their margins. Intel also hasn't yet loosened up its licensing fee structure like it promised yet. That is most certainly the point. Of course they would ship the cable anyway, but the Thunderbolt various cables and reliability and the various versions of USB 3.1 cords means that removing the ability to lose the cord ends that issue. Intel not letting Thunderbolt 3 full open access is holding it back, the more computers that don't have Thunderbolt 3 due to the cost(Its still not built into some newer Intel CPUs yet), the less need for Thunderbolt 3 accessories, and then the resulting few and expensive options in Thunderbolt 3. I can't remember exactly, but heard that a Thunderbolt controller is less than $10 (2-ports) and since the USB-C port is universal, regardless of protocol, the price of the port connector should be the same wether it carries Thunderbolt (which is also USB) or USB only. From what I'm reading just about every high-end PC is coming out with at least one Thunderbolt port. If it's not on all PCs it's probably because it seems unnecessary on the low-end, not because it's prohibitively expensive. I considered that, but wondered if that cost is high enough to account for the wide difference in price we're seeing between Thunderbolt devices and equivalent USB versions? Is the cost of implementing Thunderbolt high enough to make a drive enclosure twice the price of a USB box? "The enclosure is designed to prevent casual removal of the media. To Disk Utility, it identifies as PCI-E storage. Nekteck is properly identified as the vendor in the macOS System Report." I presume, despite the paragraph that follows, that this doesn't have much to do the with physical enclosure/cable, but rather the manner it communicates. So the computer is addressing the SSD drive directly, rather than a bridge (like USB/Firewire/etc)? Do most other Thunderbolt drives not do that? And how does that "prevent casual removal of the media"? Would this make it a more stable boot drive option, then? You call this out, so I presume it is unique enough to merit comment, but there is no further detail provided. There's a few different things here. A PCI-E bridge is different than other bridges, say, a USB 3.1 type C one. It's still a "bridge," although defining "bridge" in this context is complicated some by how Thunderbolt addresses PCI-E media. In some knock-off products, the vendor or bridge won't be properly identified. This is mostly detail on the product, and it not being a cheap knock-off of something else, rather than any other implication. The enclosure isn't secured by screws, thus the "prevent casual removal of the media." Ah. I had inferred that it might behave differently in the OS or the like. Thanks for the info. I had thought -- as I presumed this was more about how the volume was addressed -- that "removal" was more related to un-mounting the volume, rather than physical disassembly. And, although I'm no stranger to taking things apart, I think by the point tools are required, it ceases to be "casual"
Thank you for the review, Mike!